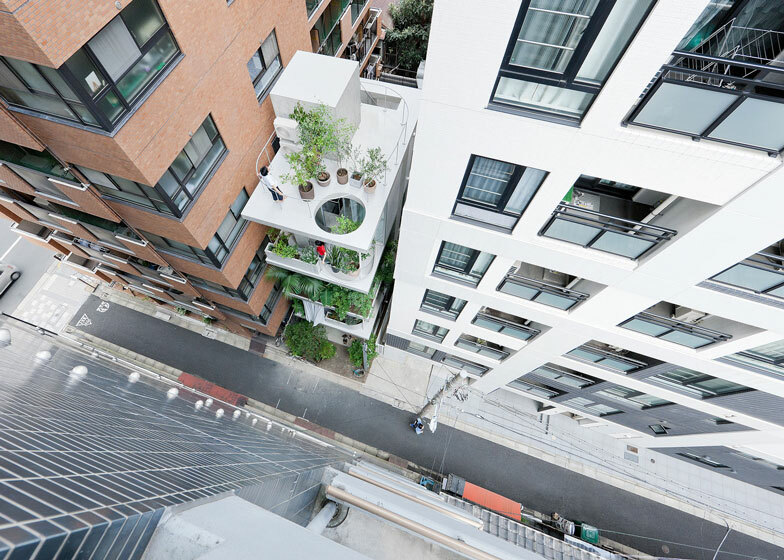 This Tokyo five-storey townhouse by Japanese architect Ryue Nishizawa is fronted by a stack of gardens. Located in a dense commercial district, the building provides a combined home and workplace for two writers. The site was just four metres wide, so Nishizawa designed a building that has only glass walls to avoid narrowing the interior spaces even further. "My final decision of structure consisted of a vertical layer of horizontal slabs to create a building without walls," said the architect. Gardens are interspersed with rooms on each of the four floors of the building, creating a screen of plants that mask the facade from the eyes of passing strangers. Glazed walls beyond protect the interior from the elements. Staircases spiral up through the building, passing through circular openings in the thick concrete floor plates. A similar opening cuts through the roof, allowing taller plants to stretch through to the upper terrace. Bedrooms are located on the first and third floors and are separated from meeting and study areas with glass screens and curtains. Ryue Nishizawa is one half of architectural partnership SANAA, which he runs alongside Kazuyo Sejima. The pair recently completed a new outpost of the Musée du Louvre in France, while other projects by the studio include the Rolex Learning Centre in Switzerland and the New Museum of Contemporary Art in New York. See more architecture by SANAA.